Housed in Chef David Bouley's space that was once Danube (his past Austrian restaurant), Brushstroke is Chef Bouley's new project and partnership with the Tsuji cooking school in Osaka, Japan. It isn't necessarily your typical sushi-serving Japanese restaurant--in fact, per the New York Times, Chef Bouley insists that Brushstroke is not a sushi restaurant, even though one course offers a sushi option. It all began when Chef Bouley made a trip to Japan to visit the Tsuji cooking school, when he suggested to Yoshiki Tsuji, who runs the school, that they should do a restaurant together. Since then, "he and a rotating team of chefs have worked on recipes in the Bouley test kitchen," with a focus on ingredients, which "led to a wide-ranging program of importing Japanese seeds to cultivate special produce varieties, including eggplants, in California, New York and New England." 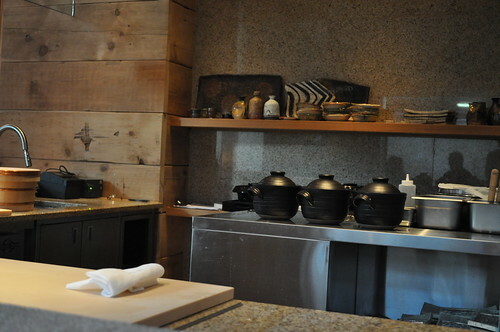 The kitchen is run by head chefs Isao Yamada (a former restaurant owner in Japan) and Hiroki Murashima (a former teacher at the Tsuji school). 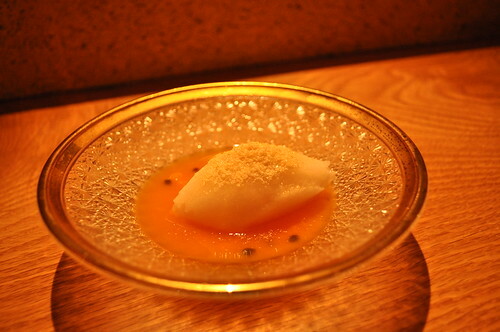 As such, Chef Bouley has said the restaurant is aiming to be "Kyoto-style" which in turn implies seasonality, as there are twenty seasons in Kyoto, Japan. The restaurant's menus, design, and experience will tailor to these "seasonal changes" accordingly. 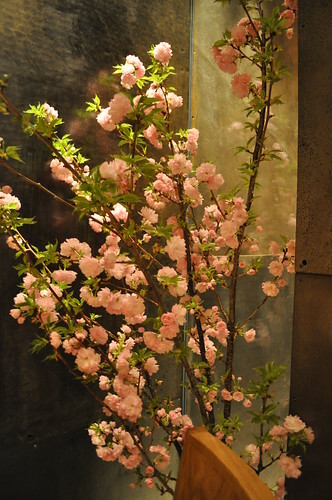 Currently, Kyoto is celebrating Sakura, i.e., the cherry blossom festival, explaining the above floral arrangement inside Brushstroke. Brushstroke has been a decade in the making, and I was lucky enough to nab a reservation on its opening day to the public. The restaurant's name came from a sign on the wall of the building that Chef Bouley originally planned to use as the restaurant's space, but due to many structural problems, the space was moved to Danube's former space on the corner of Hudson and Duane Streets. Making it to a restaurant on its opening debut day to the public was an entirely new experience for me. In the past, I've been to restaurants when they've been open for a couple weeks (sometimes even only for a few days), but never have I had the pleasure of sitting at a restaurant (one of Chef Bouley's, no less) as a privileged diner that gets to see and eat from the first ever menu before the rest of the public (not counting journalists and VIPs who have attended preview dinners). 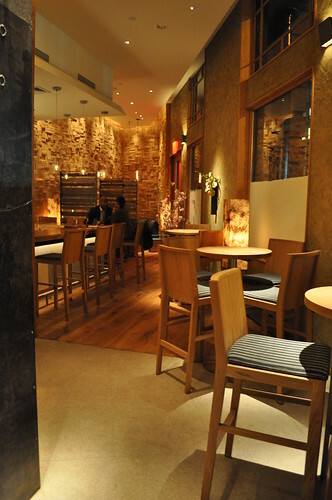 This is the bar/lounge area of Brushstroke. The walls here are covered with vertical and horizontal stacks of old paperbacks (the New York Times citing there are more than 20,000 books) with their page ends facing out. This plays a visual trick on the beholder, as the walls look like slabs of wood, complementing the rest of the restaurant's interior, commissioned to Japanese design firm, Super Potato. 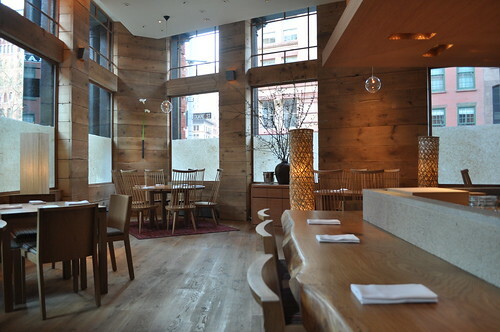 Here is the main dining area and counter--the interior here is mostly made from honeyed wood (majority of it reclaimed). Marcus and I were fortunate enough to get a reservation for two at the counter, where we could watch the kitchen's chefs prepare all of the tasting courses while enjoying the dinner. It was not only an important day for Chef Bouley as Brushstroke was debuting for the first time, but it was also a special day for Marcus and me--it was our one-year anniversary! More view of the dining area--love those lamps! The imposing panels seen by the window are made from reclaimed steel from Staten Island. View of the kitchen preparation area. Look at all the beautiful Japanese ceramic ware! I started off the night with some genmai tea, a fine Gyokuro green tea mixed with toasted brown rice. 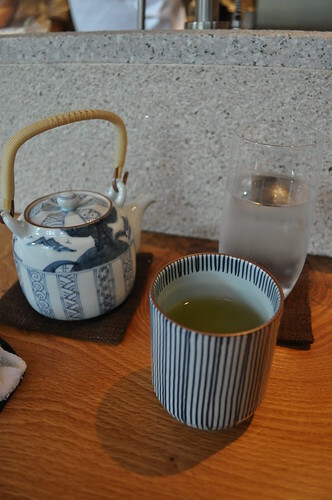 I enjoy having green tea paired with dinner at Japanese restaurants, particularly when it has a toasted flavor to it! 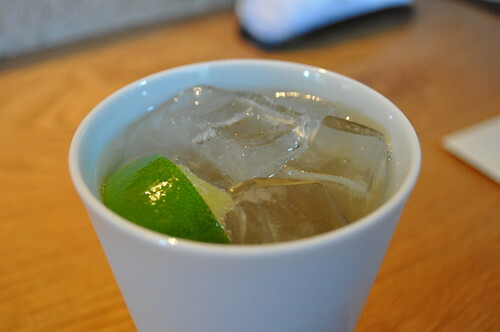 Marcus went with the homemade ginger ale, which he found to be a lot sharper and biting in taste than the taste of standard ginger ale found in the grocery store, probably because the restaurant uses actual ginger root when it is made. He usually finds ginger ale to still have a soda-like undercurrent. As such, he reported the ginger ale here didn't have the soda flavor to it, making it different from what he was expecting, but he still enjoyed it very much. 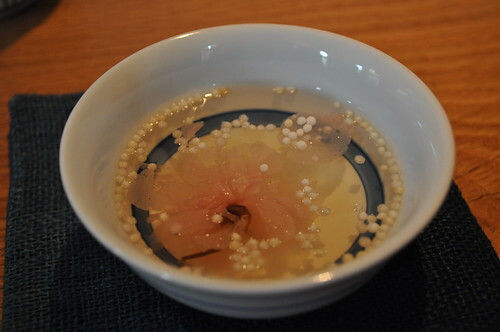 The chef's tasting began with a light broth infused with a cherry blossom flower and rice pops. 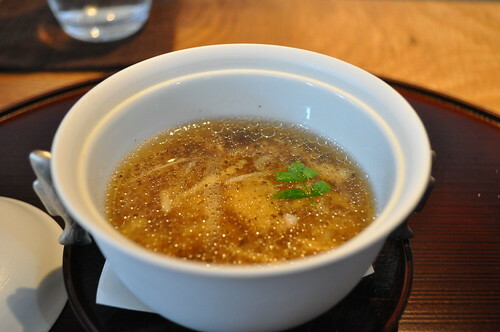 It was really refreshing, but I found the infused broth to be a bit bitter from the blossom. I do like how the restaurant incorporates the current season of Kyoto into its menu and décor. This was the first course--on the left, young vegetables in miso-mustard dressing, and on the right, flash-fried spring vegetable tempura. As decoration, there was a branch with budding flowers and a candle in a cut out vegetable or plant--not sure what it was exactly, but really pretty nonetheless. 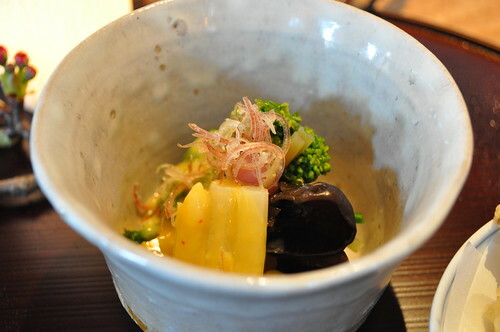 The young vegetables included nagaimo yams, broccoli rabe, radish, and other vegetables that escape me now. The vegetables were very refreshing and fresh, and the miso-mustard dressing paired well with it, adding a little savory-bitter spice to the plain vegetables. The flash-fried vegetables included an artichoke, oyster mushroom, and a string bean curled into a swirl. 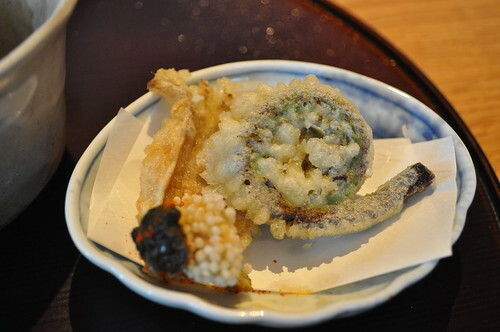 The tempura batter was really light and crispy, which was great because many restaurants tend to over-batter whatever they're frying tempura-style. The contrasting pairing of vegetables as the first dish definitely emphasizes Chef Bouley's commitment to having fresh Japanese produce available on its menu. It also a nice alternative to a salad--quite different, as vegetables tend to be offered as "side dishes" as opposed to being a part of a full course. 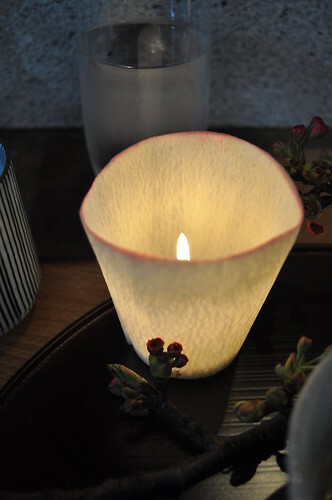 Here is a close up the candle! The next course was served in this cute little miniature bowl/cup that had silver-shaped fishes as handles on its side as well as on its lid. 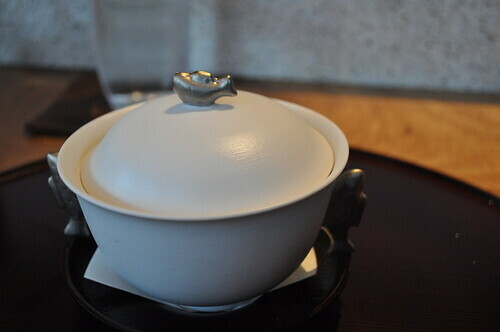 Inside the bowl/cup was chawan-mushi egg custard layered with a Dungeness crab and black truffle. The texture of this dish tasted like the shark's fin soup my family prepares during Chinese New Year combined with the dau fu fa (i.e., silken tofu with sugar), only here infused with the umami-bite of black truffle. This custard soup had a lot of depth of flavor to it, which I really enjoyed. 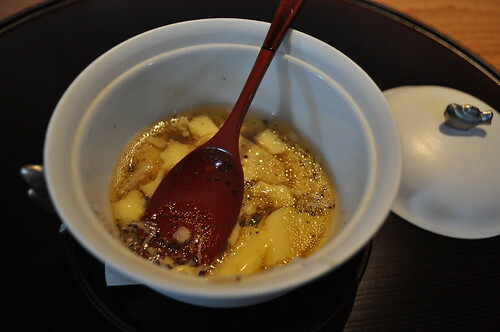 The custard has a very nice silky texture, while the crab was soft and soaked in all the flavor from the broth, infused by the black truffle, leaving quite the lingering flavor. If you're jonesing for a big explosion of umami, you're guaranteed one with this course! We watched one of the chefs prepare our next course--tuna sashimi strips, delicately seared. 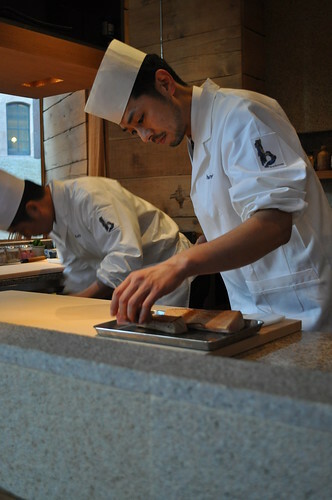 Here, he is slicing pieces of chu-toro (i.e., medium fatty tuna) to be seared. Once the pieces are seared, they are plated nicely over a bed of shredded radish. 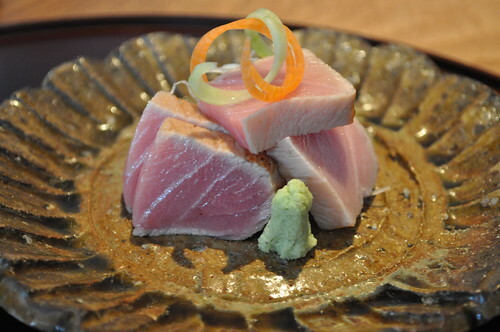 Here is the delicately seared strips of tuna sashimi, plated and ready to eat. It was served alongside spicy soy sauce with finely chopped radish mixed in. The edges of the tuna were very lightly seared, giving a little toasted flavor to it. The soy sauce mixture added a nice touch to the richness of the tuna, which melted in your mouth without much chewing effort. This was Marcus's favorite course of them all--as it reminded him of the chu-toro we had at 15 East last October for his birthday. The fourth course was a grilled black cod in sesame marinade with lightly seared sea urchin sprinkled with pistachio and pickled kohlrabi. 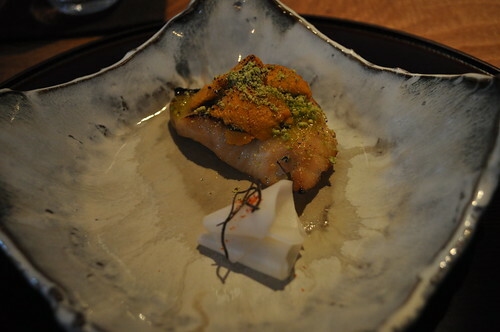 It was as heavenly as it sounded--the black cod, standalone, would have been more than adequate as a course, as the soft, rich flakes of perfectly grilled cod filet in sesame marinade would have had the expected melting buttery sensation to blow you out of the water. But the added bonuses of lightly seared sea urchin (reminiscent of the torched uni at Sushi of Gari) plus sprinkled pistachio--man, the wave of umami goodness you get from this is phenomenal. This was my overall favorite during the tasting at Brushstroke. 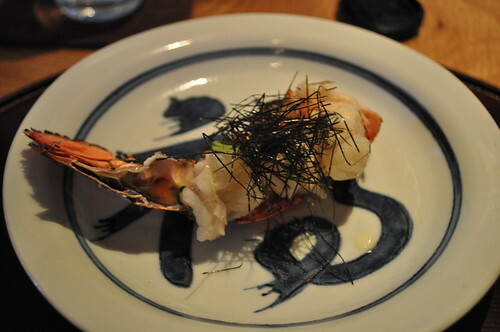 The next course was seared lobster with yuzu-miso and thinly shredded nori. While the lobster was cooked really well, to lightly opaque color, I wasn't super crazy about the yuzu-miso sauce with which it was seasoned. I felt the yuzu sauce was a bit strong, taking away from the lobster meat at hand. 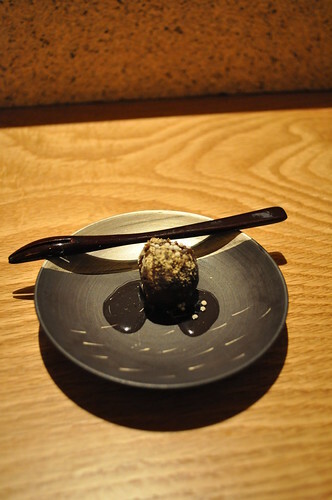 The nori had a little better handle to it, but overall, it wasn't up there with the rest of the courses for me. 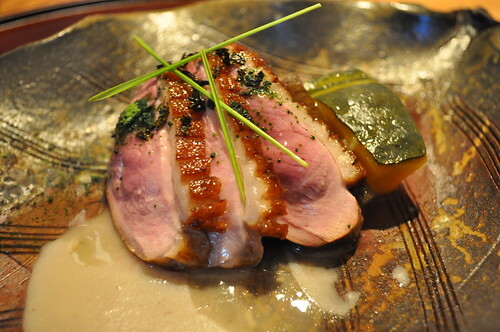 The sixth course was duck smoked with sencha leaves, served with softened agebitashi eggplant and sencha tea sauce. The first impression I got from this was whether I was in fact having duck--I thought it tasted like smoked ham! I had another piece shortly after to contemplate the taste and flavor at hand. I looked over to Marcus and asked him, straight out, "Does this taste like ham to you?" He looked at me a little puzzled, replying, "It tastes like duck to me." He took another bite of it to see if he could taste what I was tasting, then he was able to taste it a little bit. I came to the conclusion that it was probably the intensely smoked flavor that was throwing me off as I'm used to having smoked ham more frequently than smoked duck. The duck was very succulent and full of smoked flavor, and the fat from the skin definitely made the duck that much better! 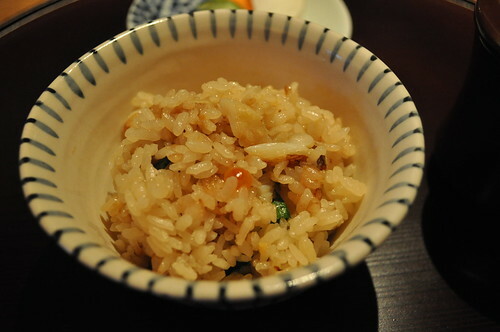 Our server was preparing/mixing our rice dishes which comprised the seventh course. We had a choice from a listing of five rice offerings on the menu, and Marcus and I each went with the rice dishes prepared in do-nabe pots, which are special earthenware pots that are used to cook over open flames in Japanese kitchens. These pots are glazed on the inside and remain porous on their exterior. While earthenware typically shouldn't be used over open flames, the Japanese-style of cooking with do-nabe pots takes special precautions when doing so. First, the outside of the do-nabe should be dry before use, as moisture within the clay will expand in the heat and may chip or crack the pot. Secondly, the pot should be heated gradually to reduce the possibility of cracks due to heat stress. Third, the pot should never be left over the flame while empty. My rice dish was Dungeness crab steamed with rice and salmon roe prepared in a rustic do-nabe pot. The rice was very flavorful--the crab meat was soft and tender while the salmon roe gave it a concentrated saltiness throughout the rice mixture. 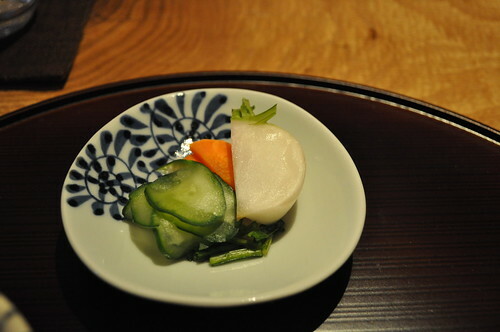 It was served alongside with seasonal pickled Japanese vegetables. 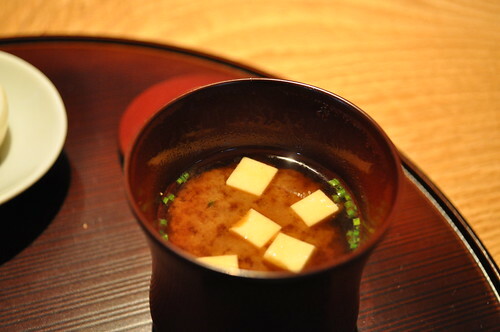 It also came with miso soup--hot wit tofu cubes and scallions. 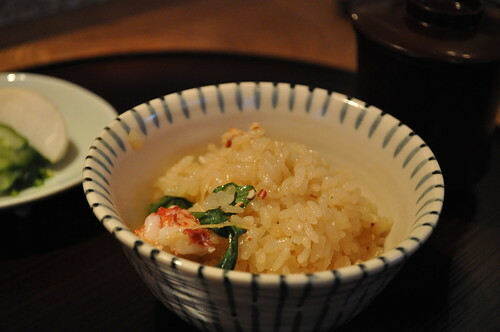 Marcus had the lobster steamed with rice and salmon roe prepared in a rustic do-nabe pot. The rice here was similar to the rice dish I ordered except it had chunks of lobsterinstead of Dungeness crab. The rice absorbed the flavors from the roe and the lobster, adding more dimension to what would've been plain white Japanese rice. Marcus really loved this course--he had three bowls of this rice, nearly finishing off the do-nabe pot! I was so full already that I only was able to finish a little under two. 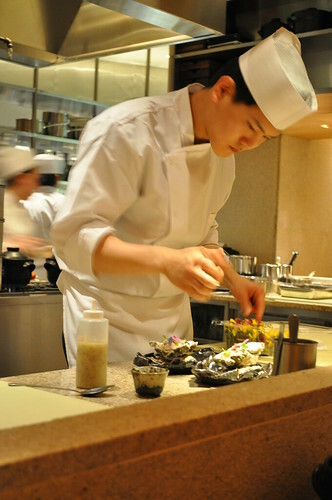 While we were eating the rice, we were watching one of the chefs prepare oysters for a table at the bar. The bar menu offers many of the courses that appear on the tasting menu, along with a few others that aren't featured on the tasting menu. This was the Pacific Jumbo oyster with grape seed mustard dressing. As a palate-cleanser, we were given a lychee sorbet (which had real lychee fruit!) with tangerine sauce and powdered honey. It was a refreshingly awesome break between the savory main courses and the upcoming dessert. The powdered honey enhanced it all very well, adding a subtle hint of sweetness without all the thick stickiness of typical honey. For dessert, and as the last of the eight courses from the tasting menu, we were served soymilk panna cotta with matcha green tea sauce and red beans lined at the bottom. 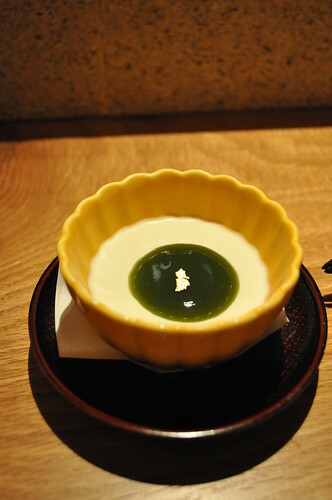 The soymilk panna cotta tasted like a very soft and smooth custard pudding which paired really well with the matcha green tea sauce--it was like having soy milk in green tea! A+ from me for dessert! Served alongside the soymilk panna cotta was a chocolate cake ball with red bean sauce and rice pops. The cake ball was very rich and dense, while the red bean sauce and rice pops added an Asian flair to what could have been mistaken for an American dessert. 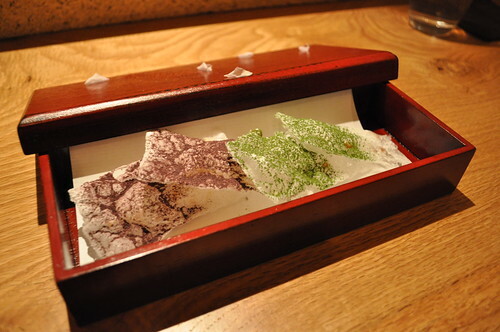 As a Japanese twist on the petit-four, we were served this nice Japanese box filled with two types of oblato (i.e., thin pieces of rice paper/cracker)--one sprinkled with shiso powder and another with green tea powder. Both contained pine nuts inside. We were told these were very delicate, so we had to eat them quickly so they wouldn't fall apart. The green tea powder had the bitter yet refreshing flavor typical in its drinkable flavor, while the shiso powder had mildly salty and tart flavor. Shiso powder is actually made from traditionally pickled and dried red shiso (beefsteak) leaves--it kind of tastes like a bitter plum to me. The oblato was very light (and indeed, delicate), making for a great ending to a wonderful tasting at Brushstroke! 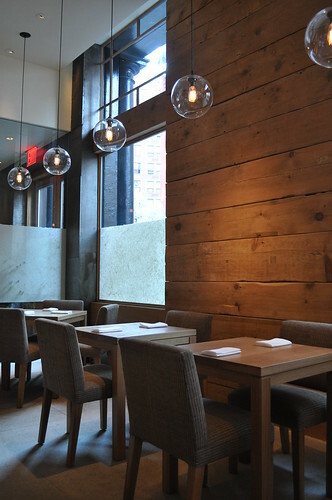 Findings: The interior space of Brushstroke is beautifully organic, as it uses the colors of honeyed wood and paperback page-ends to create a soothing and earthy atmosphere and ambiance. When you walk in, you immediately feel relaxed and will probably have a zen feeling come over you--it is not at all a harsh décor. I also admire the restaurant's emphasis on embracing the seasons of Kyoto for its menu, design, and culture--you truly feel like you're eating in a traditional Japanese restaurant in a modern era. I really believe Chef Bouley has really outdone himself with Brushstroke--in design and in cuisine. 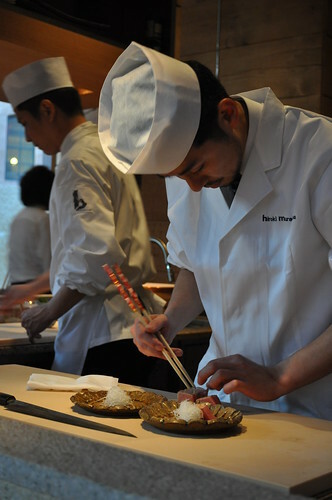 The collaboration with the Tsuji cooking school of Osaka is undoubtedly evident in the execution of all of the dishes that are served to the restaurant's patrons. Everything is meticulous, deliberate, and pragmatically implemented. There have been many times I've been to restaurants where American chefs attempt to carry out Japanese/Pan-Asian cuisine to the best of their ability, but more times than not, the menu offerings result in a fusion of dishes that stray away from the traditional dishes (most of the time for the worse--not enhancing them at all), making them highly "Americanized." To sum this experience up as best as I can, you basically feel like you're eating in a Japanese or multi-Asian cuisine restaurant in America--where chicken teriyaki and California rolls reign. However, in the case of Chef Bouley's Brushstroke (and my experience at Chef Harold Dieterle's Thai spot, Kin Shop), you most certainly do not feel this way at all. You feel as if you're in a Japanese restaurant, free of American context, perhaps even to the point where you're sitting at a restaurant counter in Kyoto, Japan. Don't get me wrong--I'm all for having chicken teriyaki and California rolls when I'm in the mood for them, when authenticity isn't an issue at hand. 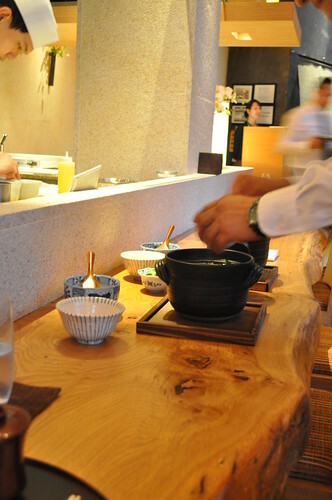 But nevertheless, Chef Bouley respects authenticity to its highest honor--where there is no skepticism or suspicion that these dishes aren't prepared in the traditional Japanese ways, perhaps with a little modern twist that enhances the overall experience of the dish. After all, that's what conducting all the work, studies, and experiments in the Bouley test kitchen was for--the bragging rights for true authenticity. I would highly recommend sitting at the counter if you can--in my opinion, it's always the best seat in the house of a Japanese restaurant. You get to watch how all the chefs prepare items from the tasting menu! The best part of it is the ventilation is amazing, where you don't leave smelling like you were in the trenches of the kitchen for the meal, like in the case with hibachi dinners. And if you don't want to commit to a tasting menu, the bar menu looks promising as well, with some of the tasting menu items offered along with other offerings. I was very impressed with the smoothness of service during the course of dinner, as it was the first day the restaurant was operating for the public. The serving and clearing of dishes was very fluid, and our water glasses were perpetually filled--never empty. Our server, in particular, was super helpful--answering any and all questions I had about the intricacies of the meal. I was expecting minor catastrophes, and there were none to have been witnessed. So big round of applause to the team at Brushstroke for making our anniversary celebration there so wonderful and enjoyable. 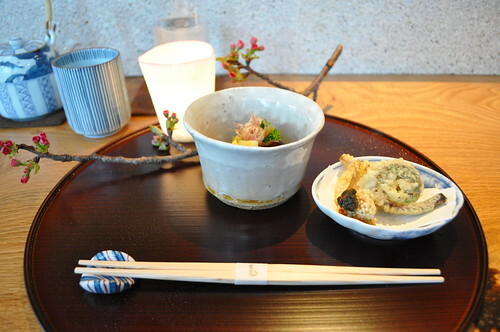 Price point: $85 per person for eight-course tasting menu, $15-18 supplement for do-nabe rice dishes; $5 for genmai tea, $6 for homemade ginger ale.